You would think that the title of our latest challenge – Decay – is not a likely subject for quilts, but when you give it some thought, there are a huge number of possibilities. I’m sure you’ll see that our members have demonstrated this in the variety of work they have produced, and the diverse way in which they have approached the subject. To see the story, thoughts and techniques behind each piece, and to view them in detail, click on the pictures below. Enjoy a taste of decay! 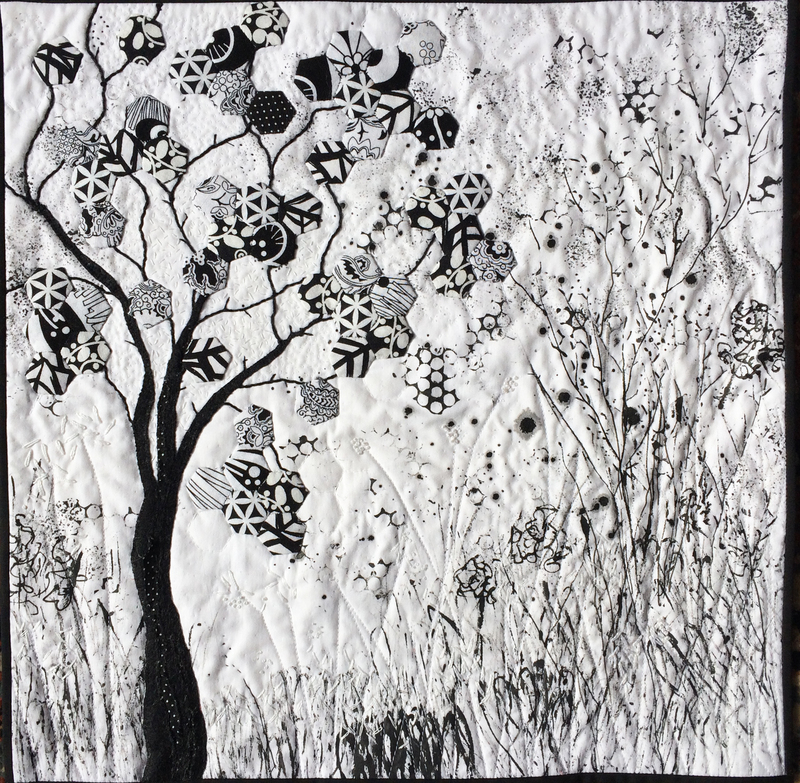 This month our challenge has the theme of ‘Blooming’, but our members may also choose to work the theme as part of a series which will continue throughout the remainder of the year, or to work it as a stand-alone piece. We hope that this will add an extra layer of interest to our members’ work, which is always varied and worked in their own distinct styles. (It sounds complicated but all will become clear as the year goes on – and I’m sure that each piece will be wonderful in its own right!). The Blooming theme immediately brings to mind flowers, but I think that the members will surprise us with their diverse thoughts on the them. We hope that you will enjoy our first selection of this year. To view the details of each quilt, and the thoughts and design behind each, click on the pictures below. This challenge – Re-arranged – opens intriguing possibilities for exploring, reworking or re-imagining designs. It could be interpreted as cutting up and reorganizing an existing work; as taking apart a familiar object or subject; or simply as altering a thought or state of mind. All of our artists will bring their own interpretations and unique styles to the subject. By clicking on each of the pictures, you will access our members’ individual pages where you can explore their thoughts, designs and techniques. I hope you enjoy the diversity. Our latest challenge uses the geometric shape ‘square’ as a starting point, but as you can see below, our members’ journeys from starting point to finished article was, as always, interesting and divergent. By clicking on each of the pictures, you will access our members’ individual pages where you can find full descriptions of their design journeys and the techniques they have used. Enjoy! This is the third and last in our series, in which the subject for the series was chosen by each artist. The theme for this challenge is ‘complementary’, where the artists will choose two complementary colours to depict their subject. 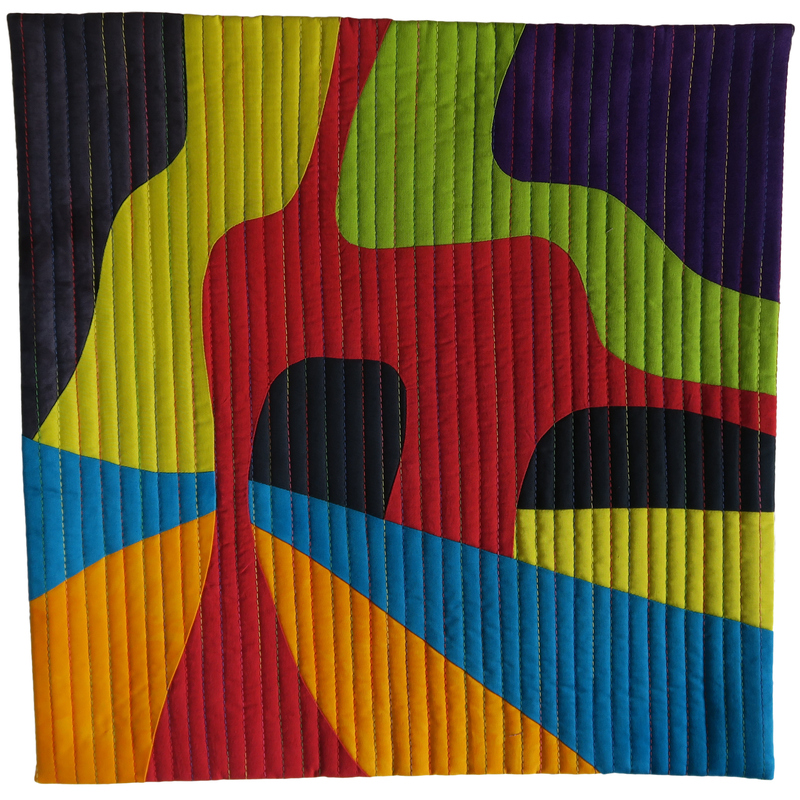 We decided that one of the colours would be picked up from our previous ‘abstract’ quilts – giving another dimension to our challenge. Perhaps the continuity in the series will interest you, so you can see each artists’ previous pieces at the end of each of their detailed entries – just click on each thumbnail below to see the full stories. This is the second in our latest series, and has the theme of ‘Abstract’. All of our members will depict their chosen series topic using this theme, and this will develop the black and white theme of the last challenge. It will be interesting to see how each person interprets their subject, particularly when the question of ‘what is abstract’ is considered. To see more about the pieces, and thoughts of the artists, please click on the thumbnail pictures below. Our second challenge of the this year sees the start of a new series of work for the group. 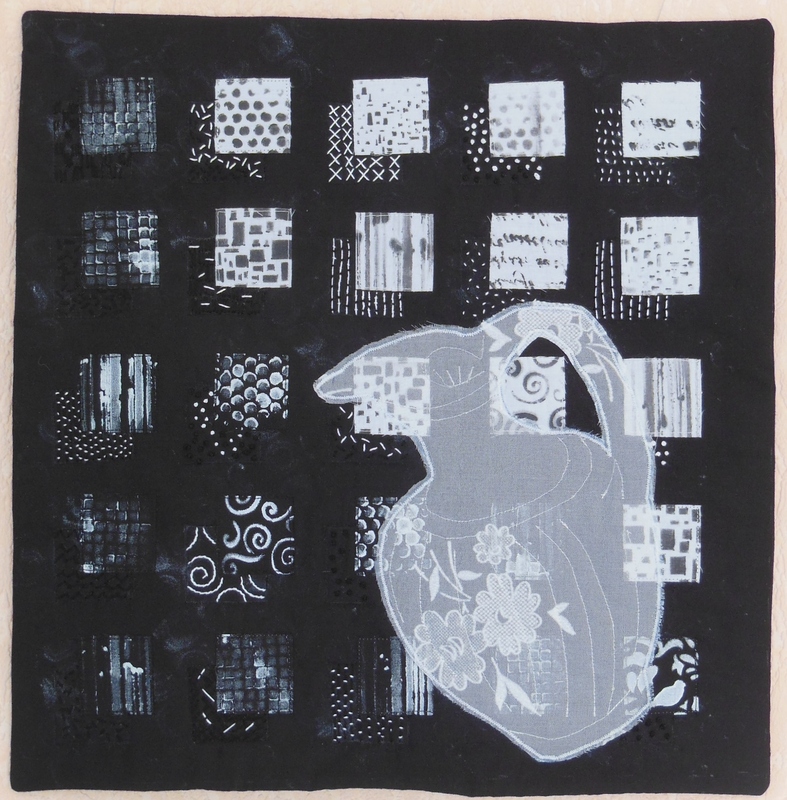 For this series of three works, each artist will choose their own subject, but this will be developed using a different theme for each of the three quilts. These have been set in advance and are firstly black and white, then abstract, and finally colour/contrast. So, all the works in this challenge use the black and white theme, and as ever the finished body of work is varied and interesting. You can see more of the work and the artist statements by clicking on the thumbnail pictures below. This is our last challenge for 2017. Our members have interpreted the different qualities of water in a variety of ways. Not only has the qualities been addressed but also the importance of water in our daily lives. I know you will enjoy reading the statements of why water was interrupted and the techniques used by our talented artists. We welcome three new members…Paola Zanda, Cindy Richard and Genevieve Guadalupe. By clicking on the thumbnail images you will be directed to the Artist’s Pages. 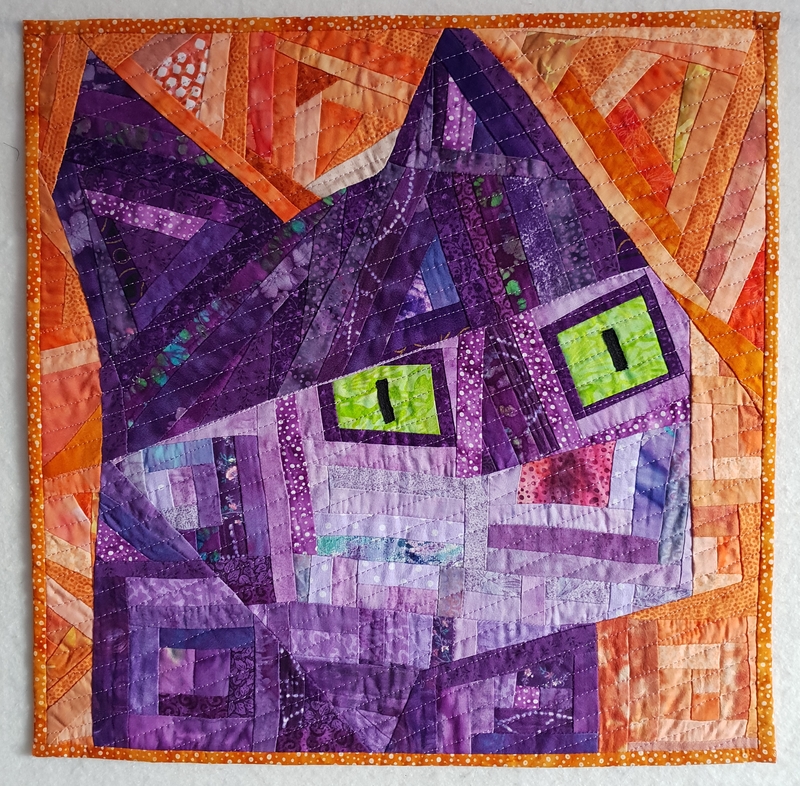 This is the last of our quilts in our Series challenge, I think you will enjoy the many ways members have interpreted their own Series, when you visit their artist page (click on the individual image) you will see all of the quilts at the bottom of their page. I congratulate members on their dedication to one theme over 10 months. Our last reveal for the year is the theme “Water”, look forward to this challenge and introducing three new members.